The best time to start full orthodontic treatment is when there are only a few primary (baby) teeth left. Age typically varies between 10-15 but most commonly 12-13. Orthodontic screening done earlier can help us predict tooth growth and plan timing of treatment which is why we recommend it for all children at age 7. You can read more about orthodontic screening by clicking here. 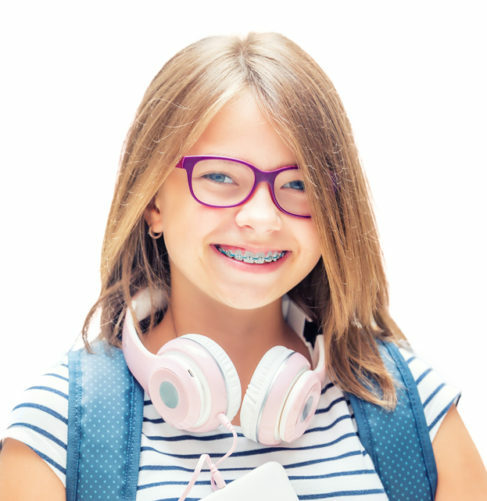 Orthodontic treatment for teenagers is usually full (comprehensive) and is supposed to address all orthodontic concerns so that future treatment is rarely needed. Treatment time varies depending on the type of appliances used, treatment complexity and patient cooperation. We would like to finish most of our cases in less than two years to minimize discomfort and side effects of length orthodontic treatment. There are different types of braces we can use for teenagers and they are listed below. Metal braces remain the most popular and most common treatment option in orthodontics. 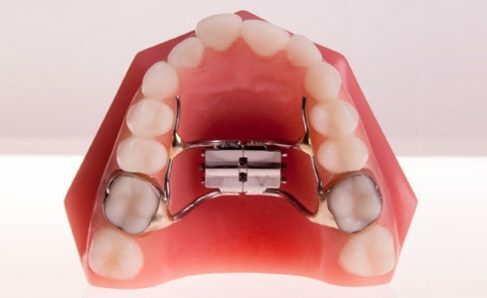 Over the years, metal braces have been improved to be smaller and more comfortable. They are still the most effective and most efficient treatment option. 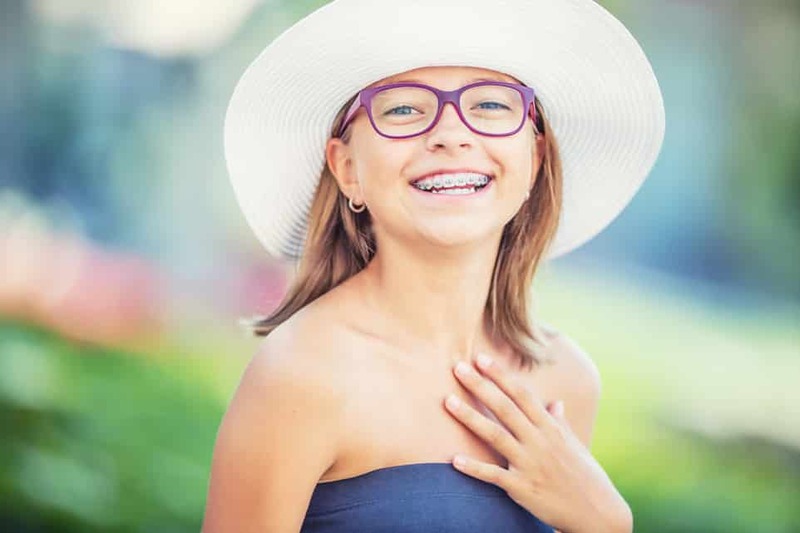 We offer different types of metal braces including Damon braces and Nickel-free Titanium braces which are recommended for patients with Nickel allergy. Most importantly, you still get to chose different colors for your braces on every visit. Who said braces aren’t cool?! Ceramic braces offer a less visible option that metal braces. They are see-through and barely show once cemented to your teeth. The wires we use, however, are made of metal and will still be visible. Nonetheless, many of our patients who had ceramic braces have told us that their friends had told them they did not even notice they had braces on! Tip: you can still get colors with ceramic braces, a really cool look! InvisalignⓇ utilizes clear removable plastic aligners that can be used instead of braces. The InvisalignⓇ system has been improved substantially over the years and can be used to treat most cases successfully and effectively. The process starts with a smile consultation during which we scan your teeth using our amazing iTero 3D scanner. In a matter of minutes, you get to see what your teeth would like after treatment! Using a specialized, highly sophisticated software, the doctor will design a treatment plan to achieve your treatment goals. 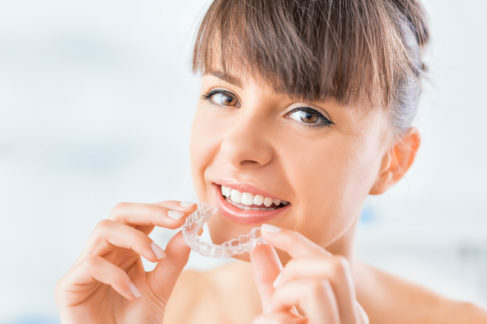 Once the aligners are made, we will teach you how to wear them and care for them. Each set is worn for one week and your visits to our office are typically once every 8 weeks. Once treatment is done, teeth are polished and retainers are used. Often times, braces are not sufficient to address certain orthodontic problems. This is when additional appliances may be recommended/used to achieve optimum results. We try to keep appliance use to a minimum to reduce discomfort and emergencies during treatment. A thorough demonstration of any recommended appliance(s) will be done during your smile consultation.